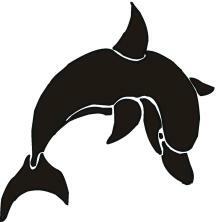 Dolphins are a symbol of wisdom, harmony, communication, trust, and community. In Celtic beliefs, dolphins are associated with water, which is used symbolicly to wash away past problems and enter a rebirth. Dolphins can also represent future hopes - for example, the desire to become as playful as a dolphin. Whales represent the connection between our conscious and subconscious mind, the realm of intuition and perception. Whales have become a personal icon for spiritual reflection. Images of whales in the early 1900's represented good fortune and plenty as they were hunted indiscriminately. Thus, "Save the Whales" became the anthem of the environmental movement. These two dolphins show their playful nature in a yin-yang fashion, forming a near circle in the waves. These beautiful dolphins demonstrate their playful and loving nature by wrapping themselves around each other. These two dolphins appear to be kissing with their flippers wrapped around each other. These two dolphins show their unity by leaping side-by-side through the waves.